Wolfgang All-Surface Cleaner 128 oz. 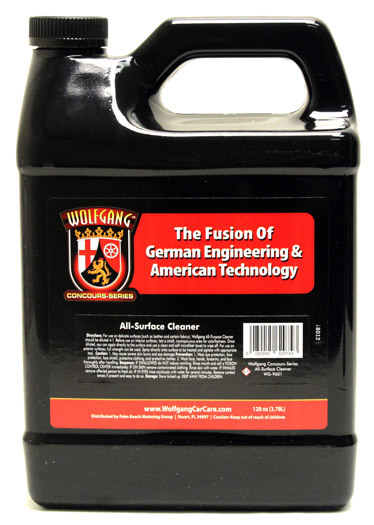 Home > Wolfgang Product Line > Wolfgang All-Surface Cleaner 128 oz. Free Bonus! For a limited time, Receive a FREE 12 oz. refillable bottle with your purchase of the gallon size of Wolfgang All-Surface Cleaner! Now there is no need purchase a separate bottle, just to use your favorite Wolfgang Product! 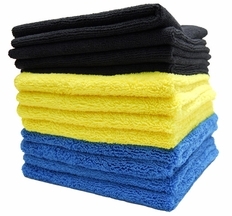 Keep all your surfaces cleaned! Wolfgang All-Surface Cleaner is an all-purpose cleaning formula designed to safely clean virtually all exterior and interior surfaces in your vehicle. Using advanced cleaners that will not harm the surface, Wolfgang All-Surface Cleaner can clean leather, paint, fabric, carpets, plastic, and vinyl of oil, grease, dirt, insects, brake dust, tar and more! Your detailing supply isn't complete without an all-purpose cleaner - and Wolfgang All-Surface Cleaner is just what you've been looking for! With so many detailing products on the market today, literally one for every step, it can be hard sometimes to find a standard “all surfaces” cleaner that works well and without causing harm. Wolfgang All-Surface Cleaner, however, does just that! This versatile formula can be diluted and is gentle enough for use on delicates surfaces, while still being tough enough to tackle nearly any mess! Wolfgang All-Surface Cleaner can be used on virtually any surface to clean away the most common stains! Dilution Ratios: For use on delicate surfaces, dilute Wolfgang All-Surface Cleaner 4:1 For use on non-delicate, exterior surface Wolfgang All-Surface Cleaner can be used full-strength. Finding a high-quality all purpose cleaner doesn’t have to be such a chore with Wolfgang All-Surface Cleaner!